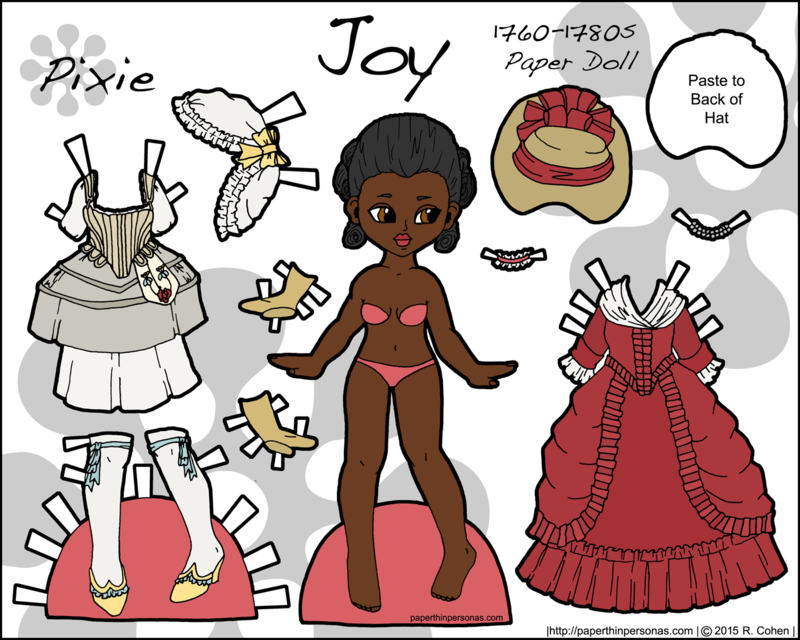 Today’s 18th century paper dolls is my second of three. 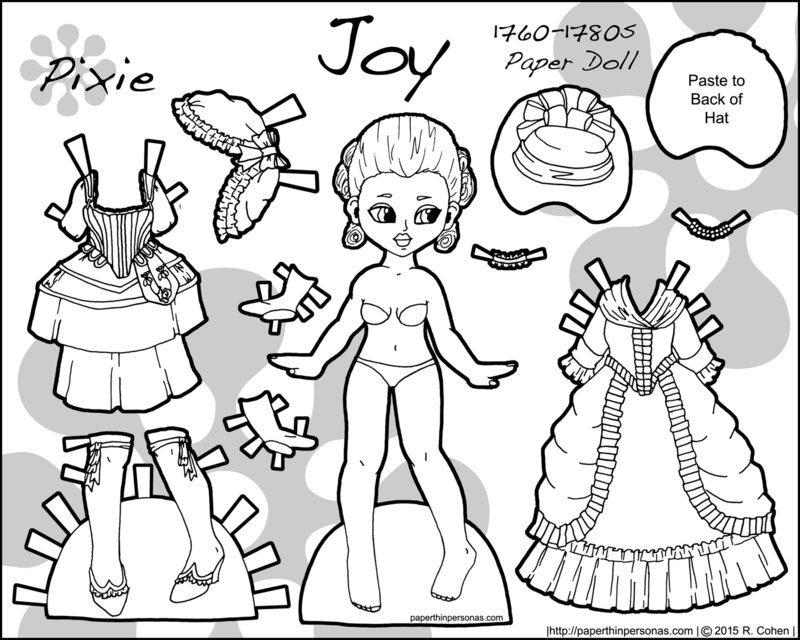 Joy, all of these paper dolls will have virtue names, is from between the 1760s though 1780s. She has underwear and a gown in the polonaise style. Poloniase gowns had a skirt that is raised up and bunched over the petticoat. Usually a gown could be worn either with the skirt looped up in the polonaise or with the skirt down- offering some versatility to the 18th century silhouette. The polonaise gown sticks around into the 19th century and is sometimes mistaken for a bustle. Joy’s gown was based on this pink silk gown circa 1770-1780 housed at the LACMA. Her shoes are based on this fashion plate from 1778. Her undergarments are based off a set held by the V&A museum dated to 1778. As with the rest of this series, I based her color scheme off my 18th century color pallet which I introduced in the first part of this series. After seeing this gown from MFA in Boston I knew I wanted to do something in a rich red color. Despite myself, I tend to think of the 18th century as being muted in colors, but nothing could be further from the truth. It has been so much fun to share this paper doll series over the last few weeks. We have four more pages with one more doll and three more sets of gowns. The whole collection, so far, can be seen here. Since we’re talking the 18th century, I thought I would call attention to a cool project I discovered this week. The University of Michigan has begun to translate and make available online the Encyclopédie edited by Denis Diderot and Jean le Rond d’Alembert in the 18th century. The section of primary interest to those of us obsessed with dress is the plates on the Tailor of Suits and Bodices, but I’ve used the Encyclopédie to show students furniture manufacture and paper making circa 1790. I love this book and can get lost in it for hours. Oh and Rachel, my Zumba mentor said she loved the doll! Ooooh, Joy is amazing! I love the red polonaise and the fact that you included at pocket with the paniers! Really liking this series so far! Another lovely set. The skin & hair color choices are perfect with the red dress. Hey Rachel, I am making a Marcus ballet paper doll to go with this month’s Mia and Monica. I can’t wait until you see it!